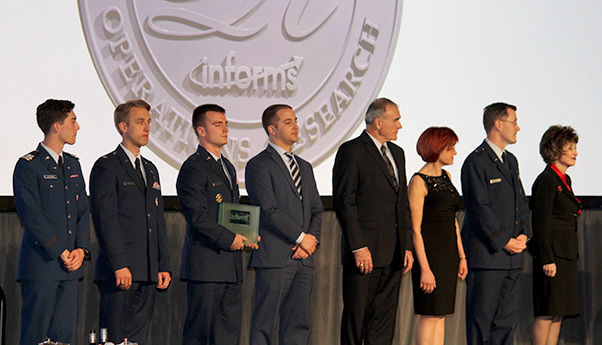 Members of the Air Force Studies, Analysis and Assessments directorate received the INFORMS Prize April 3, 2017, at a gala in Las Vegas, Nev. The award is given to organizations that have repeatedly applied the principles of operations research in pioneering, carried, novel and lasting ways. 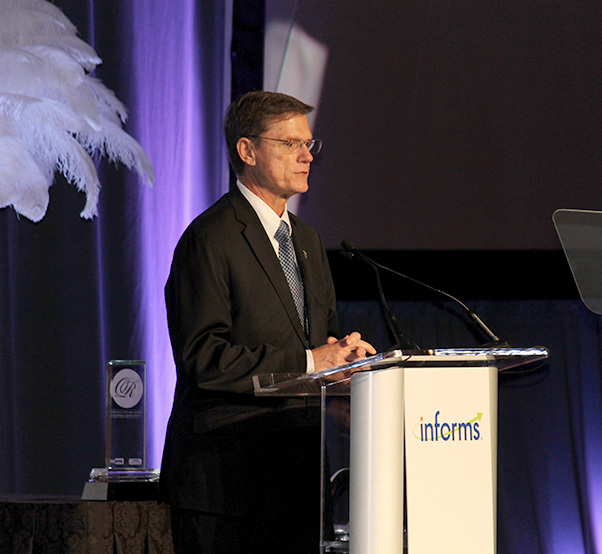 Members of the Air Force Studies, Analysis and Assessments directorate joined leaders of the Walt Disney Company as co-awardees of the INFORMS Prize at a gala in Las Vegas, Nev., April 3, 2017, for their pioneering and enduring integration of operations research and analytics programs. The award is given each year by The Institute for Operations Research and the Management Sciences. 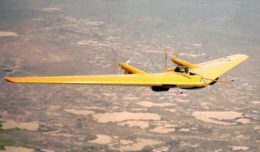 The goal of operations research, according to the INFORMS mission statement, is to turn complex challenges into substantial opportunities by transforming data into information, and information into insights for making better decisions and improving results. Kevin Williams, the director of Air Force studies, analyses and assessments, accepted the award on behalf of the service and gave remarks. Kevin Williams, the director of Air Force studies, analyses and assessments, speaks after accepting the INFORMS Prize award on behalf of the Air Force Studies, Analysis and Assessments directorate April 3, 2017, at a gala in Las Vegas, Nev. The award is given to organizations that have repeatedly applied the principles of operations research in pioneering, carried, novel and lasting ways. The award is given to organizations that have repeatedly applied the principles of operations research in pioneering, carried, novel and lasting ways. Past recipients of the award include General Motors, Intel, UPS, HP, IBM, Ford, Procter & Gamble and GE Research.